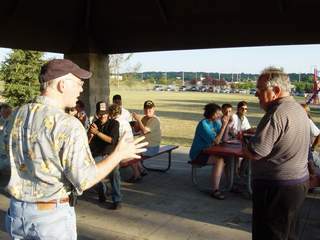 The fifth annual RARC Picnic was held on Tuesday, August 12, 2003, at Foster Arend park in north center Rochester. About 30 club members and their family members enjoyed the beautiful evening at the park. A very brief business meeting was held to give club members an update on the status of the new 146.82 club repeater. Several RARC members brought radio equipment to operate and demonstrate. Randall Trapp set up a monitor station at the picnic site. RARC club president, Fred K4IU (left) and Stew WØSHL give club members a brief update on the fund raising status for the new 146.82 club repeater. 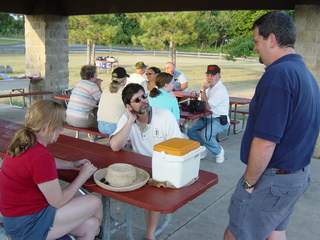 Club vice president Eric KFØS (on right) chats with Tony ABØSM and his wife during the club picnic.